The Chronicle has described it as one of the most hated junctions in Tyneside and also one of Britain’s most dangerous roundabouts. So why is the Council proposing more traffic and faster speeds, and claiming against all logic that this will somehow improve safety? In 2016, Newcastle City Council proposed a pair of oversized junctions at Blue House and Haddricks Mill. Following widespread protests about the Blue House proposal, the Council formed a working group made up of residents, local groups and Councillors that met over the period of a year or so to come up with a new recommendation that better meets the needs of those that use it. You can see that recommendation here. The Haddricks Mill proposal also received substantial feedback. The top three comments overall were a smaller footprint, removing the restriction to enter Hunter’s Road and better walking and cycling facilities. Unlike for Blue House though, it seems the design had no further input from residents until it was published last week. SPACE for Gosforth also submitted feedback at the time asking for a more traditional, easier to drive, roundabout with safe routes for walking and cycling, including better access to the Wagon Way. 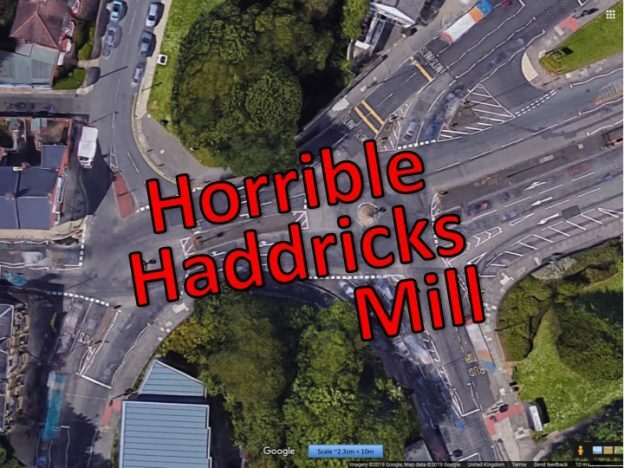 The new Haddricks Mill proposal looks very much like the current (hated) junction, and unless you look quite closely it is hard to see where the £4m budget is being spent. Most of this budget, we think, will be spent on work to maintain the bridge over the Ouseburn so won’t result in any visible improvement. The main visible change will be that the current pedestrian lights will be replaced with multi-stage Toucan crossings that can be used for walking or cycling. These lights will also be connected to a control centre and will be used to control traffic as well as helping people to cross. 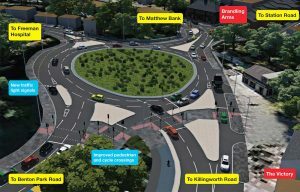 The Council are also proposing to increase the diameter of the roundabouts by shortening the approach lanes and moving the centre circles. The Council say that this, along with the traffic-controlling lights, will allow larger volumes of traffic to use this junction. Haddricks Mill is part of the Clean Air Zone that the Council is proposing in its Air Quality Plan. If that is implemented then traffic volumes should reduce at this location. Spending public money to increase vehicle capacity when demand is reducing makes no sense at all. SPACE for Gosforth has written to the Council to set out our concerns about safety, poor quality of the design and potential negative impact, especially on older or visually impaired people. The proposal does little to improve safety for users of the roundabout and may actually make it worse. In the Council’s proposal, the centre circles are small so it will still be possible to drive across the junction at very high speeds. Higher speeds mean collisions are more likely to result in serious injury. Safer roundabouts have larger centre circles which limit speeding. Two-lane roundabouts are also more dangerous than roundabouts with a single entry lane. According to the US Department of Transportation, based on UK data “flaring the entry width from one to two lanes is likely to increase injury crashes by 25 percent”. Case studies from France provide similar feedback: “very large roundabouts with multiple lanes cause many problems and are not good for safety”. In the diagram below, the orange circles show that space is available to have larger centre circles that would help prevent excessive speed. On the left (west side) this could be a one-lane roundabout, making it safer still. On the right, the solid line shows how big the centre circle could be with two lanes around the roundabout, but this could also be designed to have one lane of traffic. As well as the centre circle, tightening the corners also helps prevent excessive speed and reduce the risk and impact of collisions. Two examples are included in the next diagram shown by the red lines. These would make no difference to anyone travelling at an appropriate speed, so should have minimal impact other than to reduce the number of people injured at this junction. A slight widening of the pavement on the north side of the bridge. A small change to the Wagon Way entrance, though still very narrow for a shared path and still having a hair-pin bend. Segregated walking and cycling lanes on Haddricks Mill Road, though we believe these will only extend for a few hundred metres. The length isn’t an issue as transport schemes are often implemented in a piece-meal fashion. The fact that these are interrupted by every single driveway is an issue. These are all very welcome of course, but hardly justify the Council’s description of ‘A Major Safety Upgrade’, and are substantially undermined by the wider design. One of the key principles of safe road design is to separate users by speed and mass. This is currently achieved for people walking by having a network of pavements separate to the main carriageway. Get on a bike however and, whether you are 8 or 80, you are immediately expected to share a road lane with buses, HGVs, cars and taxis that are many times your weight and travelling many times quicker.The results of this are clearly evident in the collision and injury statistics for the junction. In the Haddricks Mill design, the Council have proposed resolving this by having people walking and people cycling share the pavement. We know this can be an issue for older and visually-impaired people. The Council does say that separate walking and cycling paths have been incorporated “where space allows”, however it appears the Council only judge this to be the case on Haddricks Mill Road away from the junction. What the Council missed off their statement “where space allows” is “subject to other priorities”. There is demonstrably plenty of space for separate paths through this junction but the Council’s priority in designing this junction has been to seek a massive increase in motor traffic. That priority has been (or will be) achieved by reducing the quality of provision and safety for people walking and cycling, even compared to the existing provision which is already poor. We didn’t include the new crossings in our list of improvements as for the most part the rationale for the changed design is for traffic control rather than any benefit for walking or cycling. In some cases, the new crossings might lead to slightly shorter walking routes, but with a greater wait to cross compared to now. In off-peak periods we have been told the crossings will respond quickly when the button is pressed, but in peak periods when most people will be walking, you will have to wait your turn in the traffic sequence. 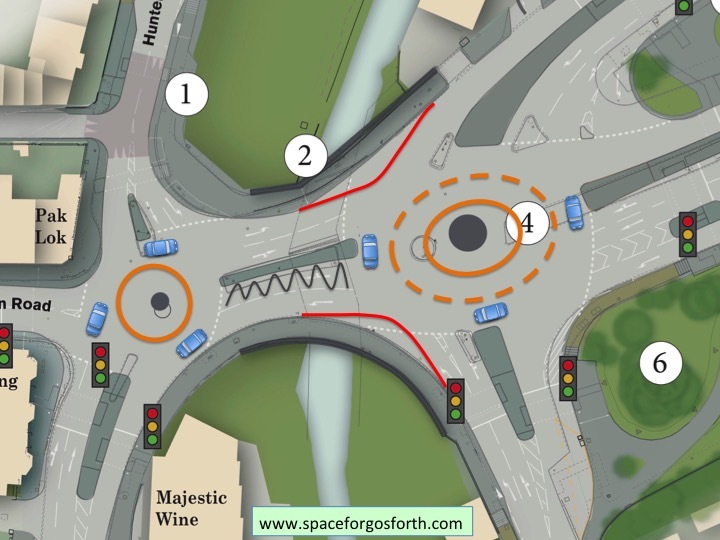 If you want to cycle through this junction in future you will have a choice. In the picture below we’ve drawn three options for travelling from Haddricks Mill Road to Killingworth Road. Two of these are via the new pavement routes and one via the road as might be used now. Council Policy says that walking and cycling routes should be safe, convenient, attractive and continuous. In this case users have to choose between safe via the pavement, and convenient via the road. If this were designed to a reasonable standard the routes could be both. For anyone who currently cycles through the junction there seems to be little benefit in the long, wiggly and slow routes around the edges, sharing with people walking. That means any forecast reduction in cycling injuries is unlikely to be achieved, and may even get worse with all the additional (and fast-moving) traffic. Others, we know, already cycle around this junction on the pavements as the safest way to traverse the junction. Police guidance is to allow “responsible cyclists who sometimes feel obliged to use the pavement out of fear of the traffic, and who show consideration to other pavement users”. This group also won’t see any benefit. The Council says “plans are designed to allow everyone to move through the junction more efficiently”. We don’t see how this can possibly be the case for cycling. The Council have also stated this plan should encourage more sustainable choices of travel. 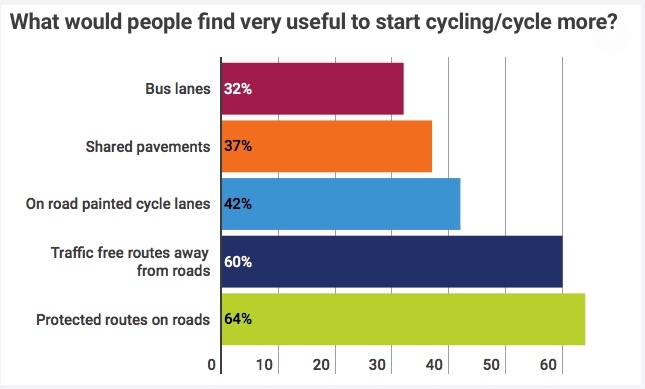 In Sustrans’ Bike Life report that the Council commissioned along with other Local Authorities, shared pavements came out as one of the least useful ways to help people start cycling, lower even that on-road painted lanes. A report by Living Streets, the UK charity for every-day walking, also concluded that “shared spaces work better for pedestrians where pedestrians outnumber cyclists, where there is sufficient space and visibility – and where there is more emphasis on a “place‟ function rather than movement. … but highlights the need to segregate cyclists from pedestrians where commuting speed is a priority”. So, shared pavements are not the right approach for Haddricks Mill. We have all seen pictures like this one, showing that design has to take account of how people actually behave, rather than assuming that people will follow rules, drive at appropriate speeds, or tolerate poorly specified, slow or indirect routes. The Haddricks Mill proposal retains all the worst features of the current junction and adds some more. People who continue to cycle on the road, because the alternatives are so poor, will be put at even greater risk than before. People walking, who had the pavements to themselves now have to share the pavements with people cycling. Local residents will have to contend with even more traffic passing through the area than now, and the changes are unlikely to make any positive difference to air quality. The Council say they want to encourage more people to walk or cycle as an alternative to driving. Building junctions that prioritise traffic volume over people’s safety is not the way to achieve it. The Council have also been threatened with legal action by Government for failing to make progress on its plan to meet air quality limits that have been met since 2010. The Council are required to meet these limits in the shortest possible timescales, a task that will be made substantially harder by all the additional traffic passing through this location. 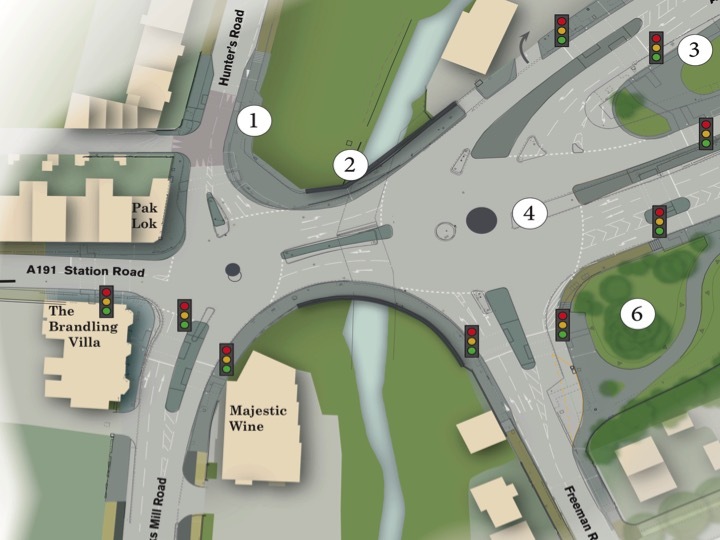 As the new junction is very similar to the current one, no legal orders will be required so there will be no further public consultation process. The Council has agreed to meet SPACE for Gosforth, to discuss the issues described above. If you have any further concerns we haven’t thought of please let us know ASAP so we can raise those too. Please also speak to your local Councillors to let them know as well. Blue House – at what cost to health? 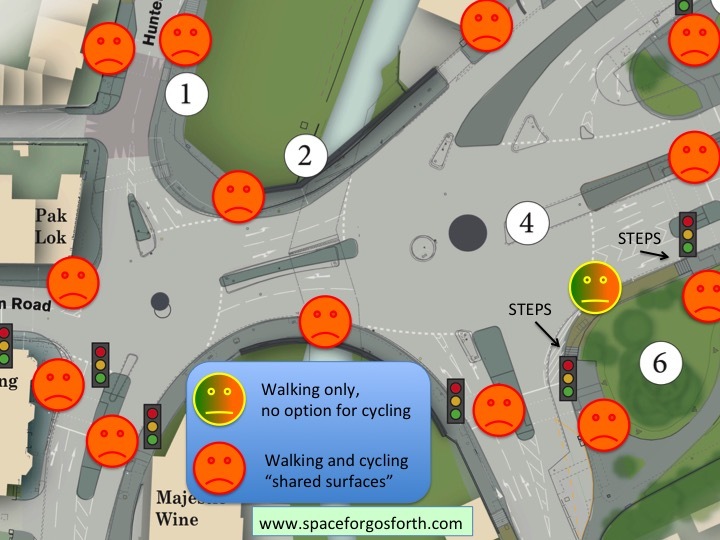 This entry was posted in Blue House, Cycling, Killing worth Road, Safety, Walking and tagged Haddricks Mill, Roundabouts, Shared Space on March 25, 2019 by SPACE for Gosforth. Excellent article and really clear analysis. Thanks.